Courier Recovery allows you to receive a shipped copy of your Carbonite backed up files on an external hard drive. Courier Recovery is only available to Carbonite Safe subscribers who live in the United States. The sections below are collapsed. Please click a section title to open / close the appropriate section. There is a $99.99 ($9.99 for Safe Prime) fee each time you use Courier Recover to recover a computer. For full pricing details, please see the table below. *An additional $30 will be charged if the Courier Recovery external hard drive needs to be re-shipped. Customers who manage their own private encryption key must upload the private key before they are able to request Courier Recovery. At the time of delivery, it is required that you sign for the package. Once you receive the recovery drive, please copy the files to your computer and return the drive within 30 days of the receipt to avoid the non-returned drive fee. 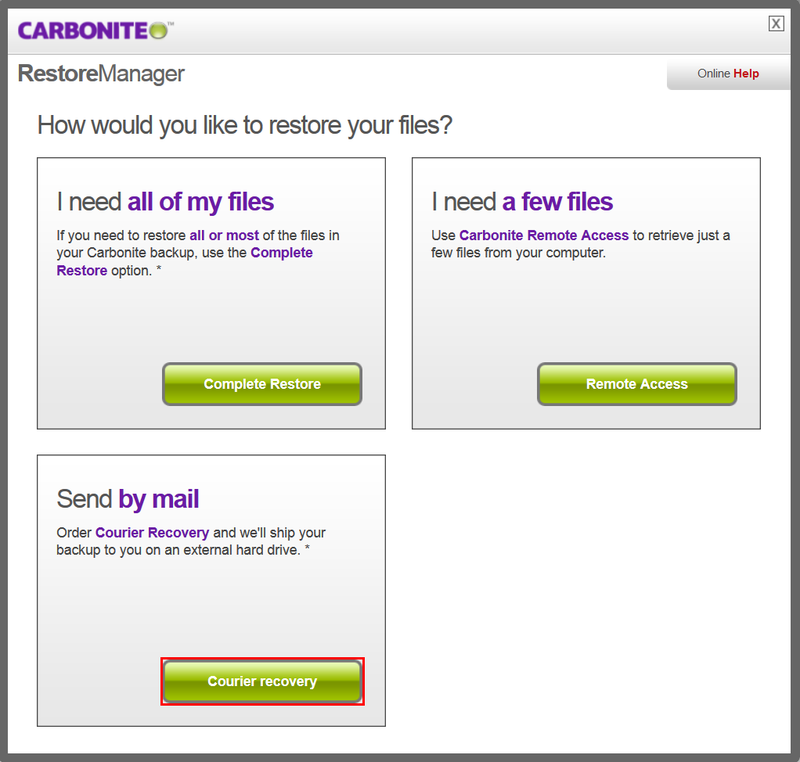 You can access the Courier Recovery service from within your Carbonite account when you need to restore files. Before requesting Courier Recovery, please uninstall Carbonite for Windows or uninstall Carbonite for Mac to prevent changes to your backup. Failure to do so could cause damage to your backup and prevent the full restoration of your files. Sign into your Carbonite account at https://account.carbonite.com. Once signed in to your account, click Get files back for the computer with which you wish to use the Courier Recovery service. A pop-up window will be displayed that lets you choose a restore method. To access the Courier Recovery service, click the Courier recovery button. On the next screen that appears, you will be required to enter your contact and shipping information. You will also be able to select a computer for recovery and specify your desired shipping method. Once all required information has been entered, click Submit Case to submit your recovery request. Your credit card on file will be charged the recovery fee. If you do not have a credit card on file, you will be required to enter your credit card details before submitting a request.